A picture paints a thousand words. Let your wedding invitation or favour speak for itself. Designer Wedding Invitations is a specialist in creating unique and exclusive wedding stationery. Our wedding stationery consists of invitations, menus, save-the-dates, programmes, thank you cards and gift boxes. We provide invitations and favours for birthdays, weddings, baby showers, bridal showers and corporate events. At Designer Wedding Invitations, we design unique wedding stationary according to your specifications, styles and taste. We have a wide variety of designs for you to choose from. Wedding favours and stationary plays a vital role in creating the look you want. It gives your guests a sneak peak of what the actual day is going to like. If you have a unique design or idea for your wedding stationary, our service is ideal for you. Our invitations consists of save the dates, invitations, laser cut invitations, embossed invitations, electronic invitations, envelopes & pockets, box invitations and foiled invitations. Our invites are clear and concise, it provides the appropriate information. Our stationary consists of menus, programs, place cards, thank you cards, seating charts, table numbers and names. We have many years of experience in bringing you the best quality wedding stationary and favours to you. Our company only uses the finest materials to create the best stationary available. We are consistently keeping up with new trends and printing techniques to give your stationery a professional finish. Each invitation is carefully crafted and designed. We believe in providing outstanding customer service. 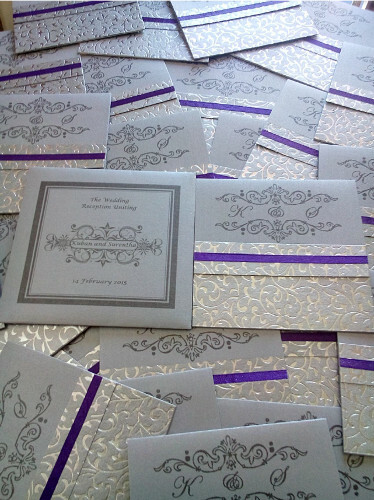 At Designer Wedding Invitations, we deliver all stationary and favours on time. We are efficient and reliable. Our stationary and favours are affordable and can be tailor made to suit your budget. With a team of professional designers, we are able to provide satisfactory services. Contact us to find out more information.